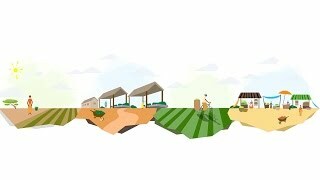 Nov. 18, 2015—This study aims to provide detailed data on the energy requirements, and possible clean-energy solutions, along three agricultural value chains—milk/dairy, rice and vegetables—to support the design of a development framework that increases the productivity and value generated in rural areas. If everything goes really well, and world population peaks by 2050, we’ll almost certainly have to grow a lot more food to feed all those people. We might avoid increases by going vegetarian or sharing wealth more equitably, but neither of those things is likely to happen on a large enough scale. The best guess at the moment is that we’ll need a 70 percent increase in food production by 2050. And that’s a problem, because it takes a lot of energy to grow food, which means a lot more greenhouse gas production. Unless … unless we can pull off the niftiest of tricks, the quadruple axel of food production, and grow lots more food while simultaneously reducing the energy — or at least the carbon emissions — it takes to grow each unit of food. A new report takes a close look at the energy that goes into our food and offers some tools for envisioning a low-carbon path forward. 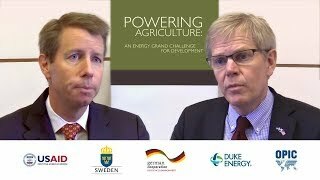 It’s called “Opportunities for Agri-Food Chains to Become Energy-Smart” and it was produced with backing from USAID, Duke Energy, and agencies in Germany and Sweden (the partnership is named Powering Agriculture). Perhaps the most surprising and hopeful indicator from this report is the data showing that we are already starting to perform that nifty trick: Food production is trending up steadily, while the energy required for each unit of food is trending down. The energy flowing into farming has leveled off in the richer regions. And while energy is still increasing dramatically in Asia and Africa, that energy is enabling efficiencies, so that those areas are able to get more food per megawatt. You can see how this more-food-per-megawatt trend might work in the following graph, which shows how waste and energy loss is divided up in high-income, versus low-income countries. In rich countries we waste a lot in our homes, restaurants, and grocery stores: Food is so cheap that we throw away anything that looks less than perfect. But in poorer countries the bulk of the food losses happen in processing and distribution — crops rot while farmers wait for a truck, for example. So just investing a little more energy can lead to a lot more food available. Maybe that energy goes to fuel another truck to take the crop to market, or maybe it powers some processing machinery that will allow farmers to convert food into a form that won’t spoil. And providing energy to farmers and food producers would not only increase the food-per-megawatt ratio, it would also enrich low-income farmers. Millions of small family and subsistence farmers could “improve their livelihoods and achieve greater productivity per hectare, or per labor unit, by gaining energy access through modern low-carbon systems,” the authors of the report write. Those last four words — “modern low-carbon systems” — are especially surprising. Sure, small farmers could decrease their crop losses if they had power — that makes intuitive sense. But it also makes sense that they’d want the cheapest energy possible. Cheap energy often means fossil fuels, not low carbon systems. As you can see in the chart below, clean energy often costs more than fossil fuels. The authors of the report acknowledge that: “It is well understood that an increase in fossil fuel energy inputs into a subsistence farming system can result in greater productivity per hectare, resulting in less demand for land and reduced manual labor.” Historically, fossil fuels have been the key to unlocking farmer productivity, and thus increasing their wealth. I called up Ryan Shelby, who works with the partnership that put out this report via his position as an energy advisor at USAID, and asked him if the report was just giving clean energy hopeful treatment. Liquid fertilizer could also be applied to the field through the drip lines, reducing labor and energy costs. In addition, depending on the crop cycle, drip irrigation could allow up to three harvests per year instead of one in the rainy season, generating enough income to quickly pay for the system. Growing asparagus, a drought resistant cash crop, allowed the small farmer to pay back the USD 1,500 initial investment in two years. That’s a great example, but I was still dubious. If clean energy is really less expensive, I asked, why aren’t countries like China building lots of small solar-powered mini grids, instead of all the big power plants they have slated for construction? China is just at a more advanced stage in the process, Shelby said. China started by having local governments build mini grids, which allowed those more remote areas to get power earlier than if they had waited to connect to the big power plants. The same thing happened in the United States in the 1920s and 1930s, he said. Shelby’s home of Letohatchee, Ala., was powered by a rural electric co-op — essentially a microgrid — under Franklin Roosevelt’s Rural Electric Administration. Eventually, these rural co-ops were connected to the main system. The same thing is happening right now, but with clean energy this time. In Haiti, a nonprofit called EarthSpark has activated Haiti’s first microgrid, powering the town of Les Anglais long before a national grid could get anywhere near the area. That’s just the beginning. The NGO is supposed to build 80 microgrids by 2020. This offers some real hope. We are growing more food per unit of energy (and unit of land), but not only that: The energy that makes the most sense for spreading these efficiency gains to rural farmland in poor countries is low-carbon energy. Since the Green Revolution, increases in food production have been inexorably paired with increases in greenhouse gas emissions. Now, we could see food production go up while emissions go down. That would be the niftiest of tricks.